Nowadays, there are tons of different mouse in the market. 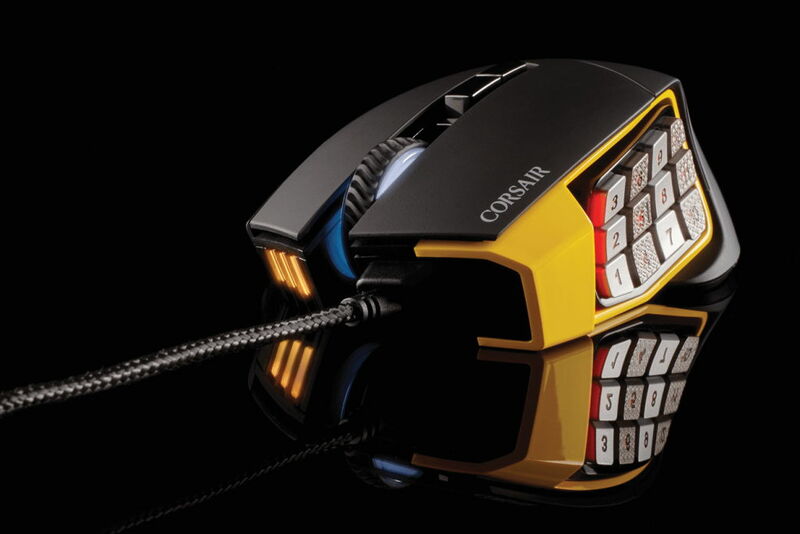 Probably, a large portion of these mice in the market are “gaming mouse” designed for gamers with specific needs. 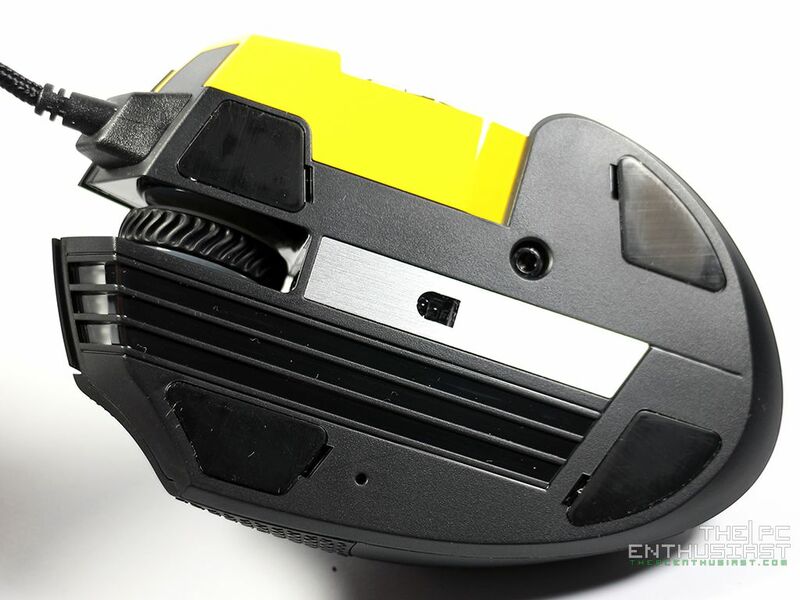 In the gaming mouse category alone, there are plenty to choose from; for FPS, for MMO, ambidextrous, for right-handed use only, with or without LED (RGB) lighting, wired or wireless and many more. 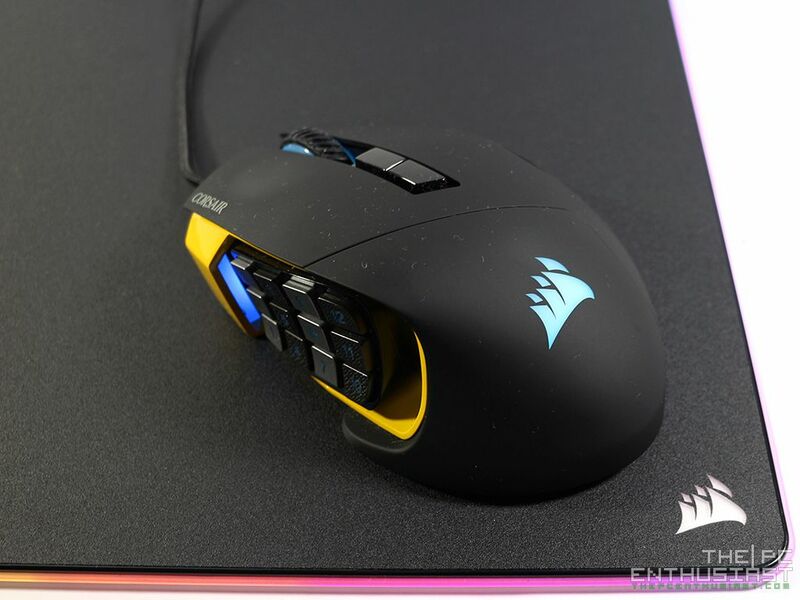 Today, we are going to check out and review the Corsair Scimitar PRO RGB gaming mouse – an updated or upgraded version of the company’s Scimitar RGB mouse. The Pro version looks exactly the same as the non-Pro; the difference is that the Pro version is built with a new optical sensor, onboard profile storage and there is now a bump on the 5 button. The Corsair Scimitar Pro RGB gaming mouse is primarily designed for MOBA and MMO gamers, but I got plenty of other use for the side buttons. 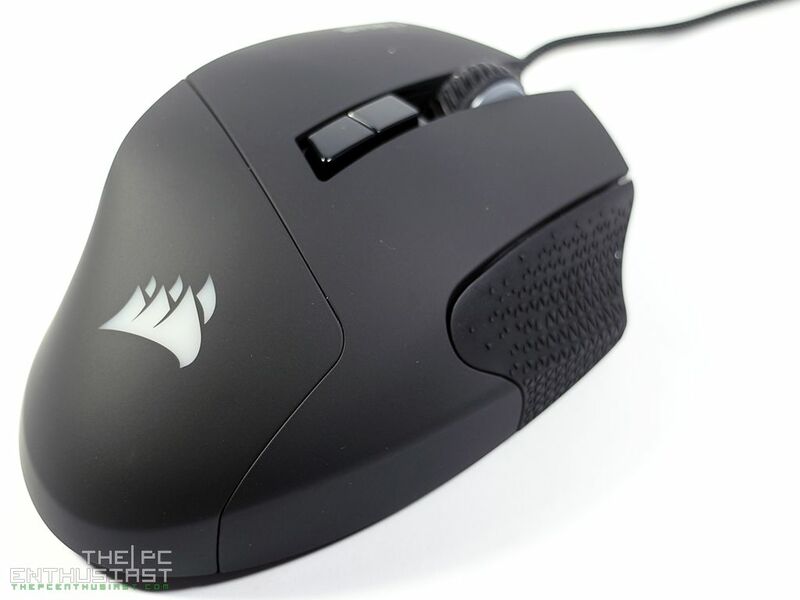 Please continue reading our Corsair Scimitar Pro RGB gaming mouse review below. 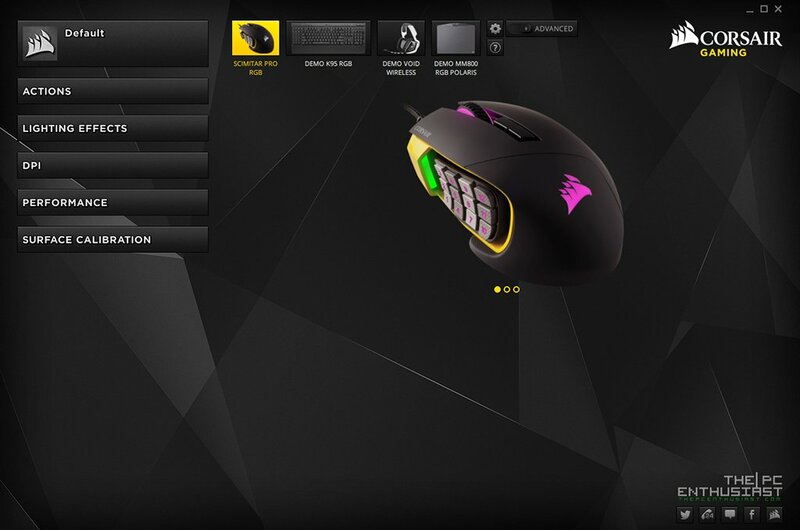 The Corsair Scimitar PRO RGB is currently the company’s gaming mouse specifically designed for MOBA and MMO players. The twelve programmable side buttons are very useful for gamers that require a number of buttons that they can easily access while in-game. While I don’t play MOBA and MMO games, I mostly play first person shooter games or RPG games; the side buttons though are very useful for me in terms of productivity and desktop operation. 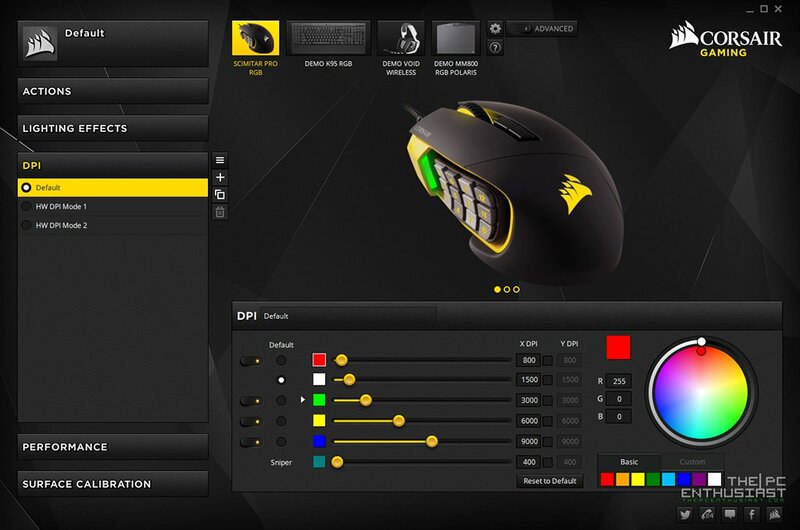 The Scimitar PRO RGB is basically an updated or upgraded version of its predecessor, the Scimitar RGB (non-Pro). So what’s the difference between the Pro and non-Pro? The newer Pro version includes all the features of its predecessors, plus a new PMW3367 optical sensor capable of 16,000 DPI. This new optical sensor was developed in partnership with PIXART. The PMW3367 optical sensor aims to deliver precise control in single DPI steps for ultra-accurate, high-speed tracking. 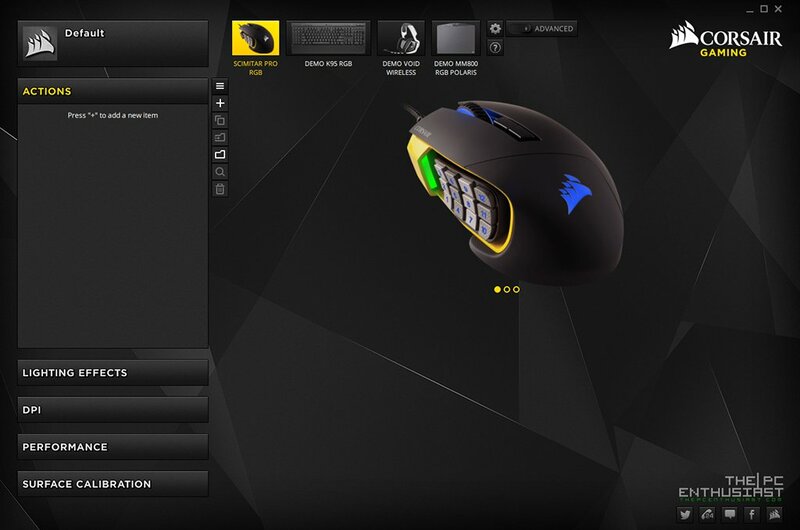 Another addition is the ability to store profiles on the mouse itself, and a few cosmetic changes like the surface area and the bump of the 5 key. 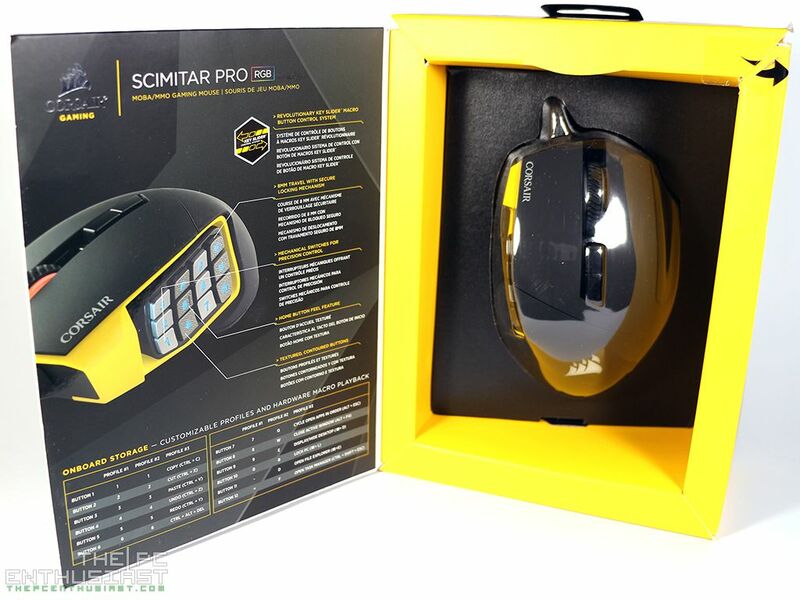 I’ll discuss more of its features as we take a closer look at the Scimitar PRO RGB mouse itself. Meanwhile, below is a list of its highlighted features and its specifications. Custom PMW3367 PIXART 16,000 DPI optical sensor: Ultra-accurate and high-speed tracking engine. 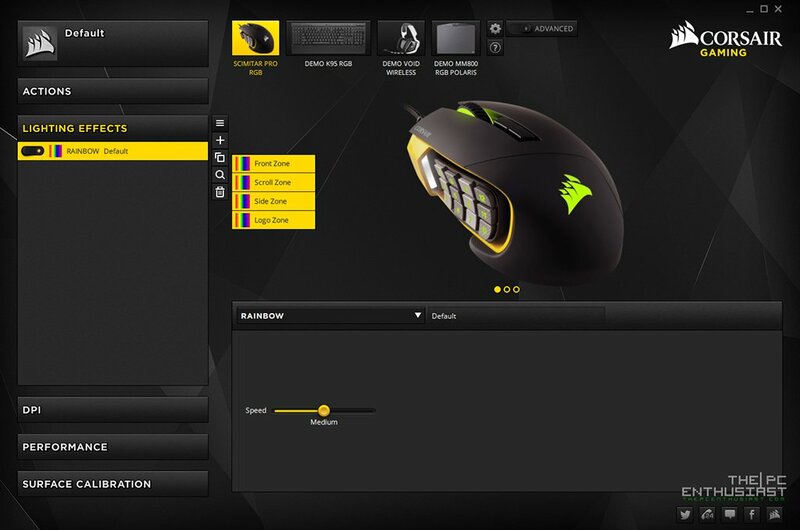 Native 16,000 DPI resolution, settable in single DPI steps, can be custom tuned to virtually any type of mouse pad. 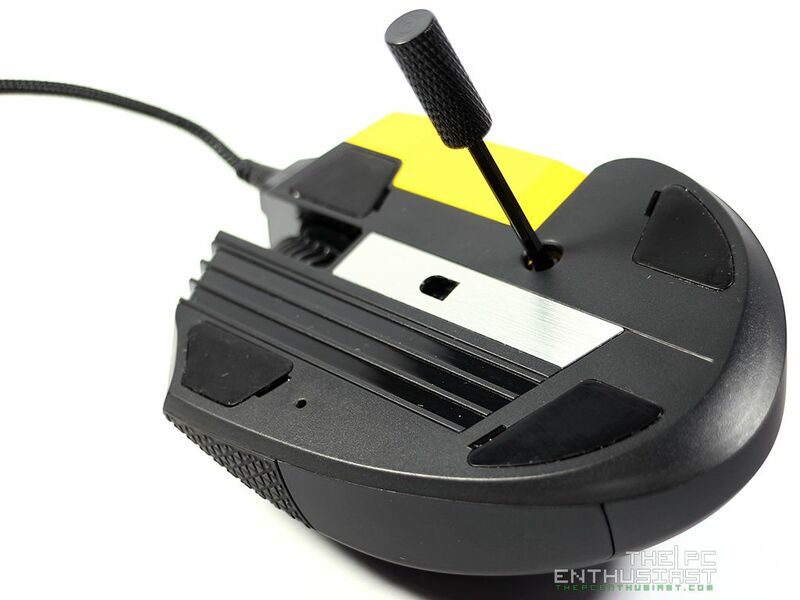 12 Optimized mechanical side buttons: Designed to pro-player specifications for consistent tactile feedback and precise actuation. Textured side button keycaps provide enhanced grip and feel. Exclusive Key Slider™ macro button control system: The patent-pending design provides 8mm of key travel with a secure lock to ensure every button is within reach. 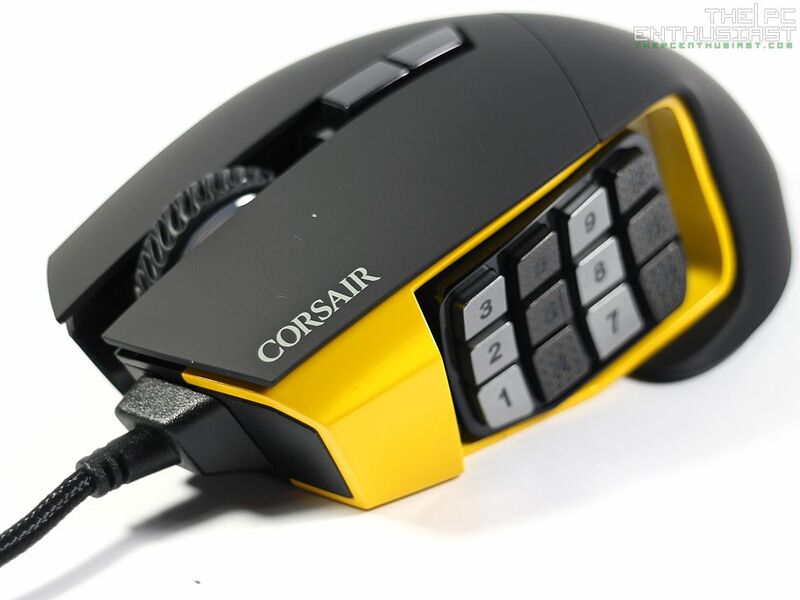 As expected from a Corsair product, it comes with a black and yellow-themed box. The packaging doesn’t feel “overly” premium, but it feels of good quality and the box itself is not flimsy at all. Most of the time, you can tell how good a product is based on its packaging; although that’s not always true. 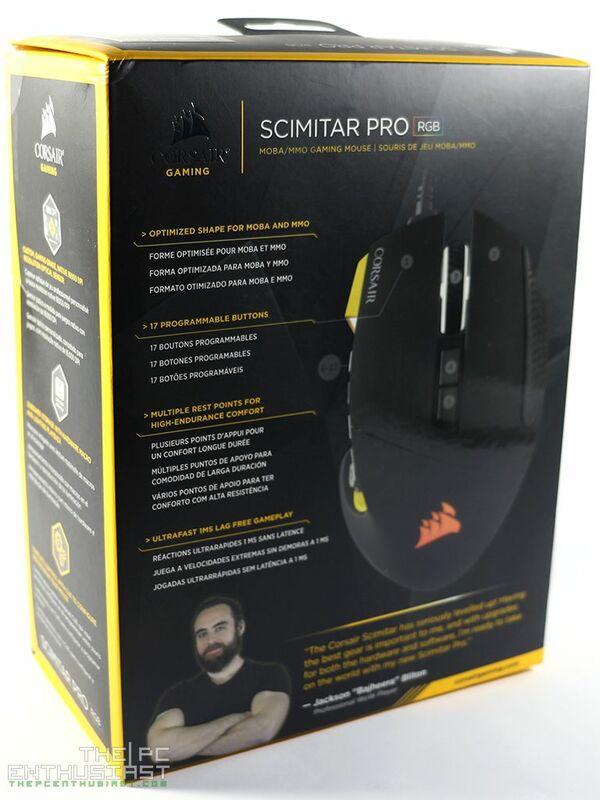 The highlighted features of the Scimitar PRO RGB are printed on the box; and detailed information about the 12-key slider can be read on the flip side of the cover. 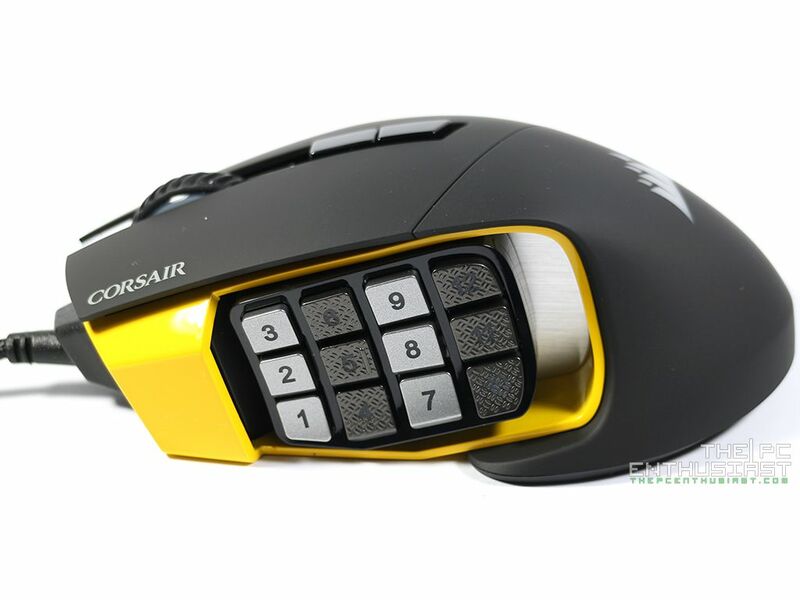 The package only includes the mouse itself, reading materials and a hex screw for adjusting the key slider. 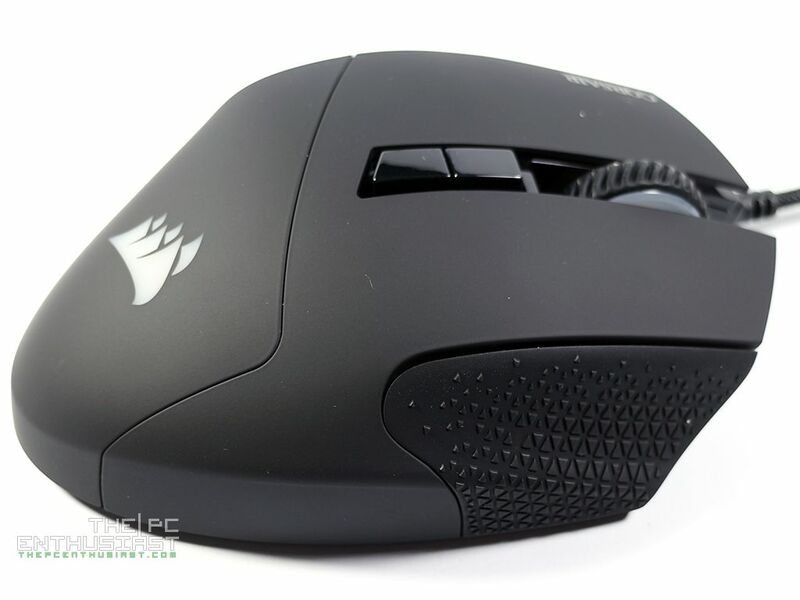 The Corsair Scimitar PRO RGB is a little bit small for my palm; it’s smaller compared to a mouse that I am used to. It measures 119.8mm in length, 77.2mm in width and 42.4mm in height. It weighs around 122 grams without the braided cable. It doesn’t feature adjustable weight, but after using the mouse for several weeks, I think I have adjusted to its weight. Although, in terms of its size, I don’t have super powers to change the size of my hand and make it smaller to perfectly fit the mouse! The surface feels nice; it’s somewhat rubbery, but at the same time feels like a hard plastic. The surface feels very smooth, and there’s a textured surface on the right side providing better grip for the ring finger. 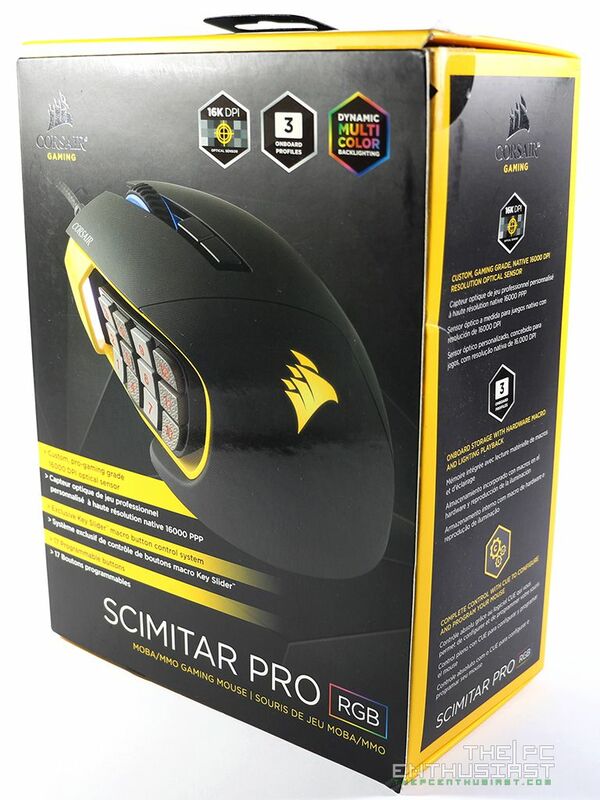 The Scimitar PRO RGB is available in two colors, yellow and black; so if you don’t like the yellow accent at the key slider, you better opt for the black version. 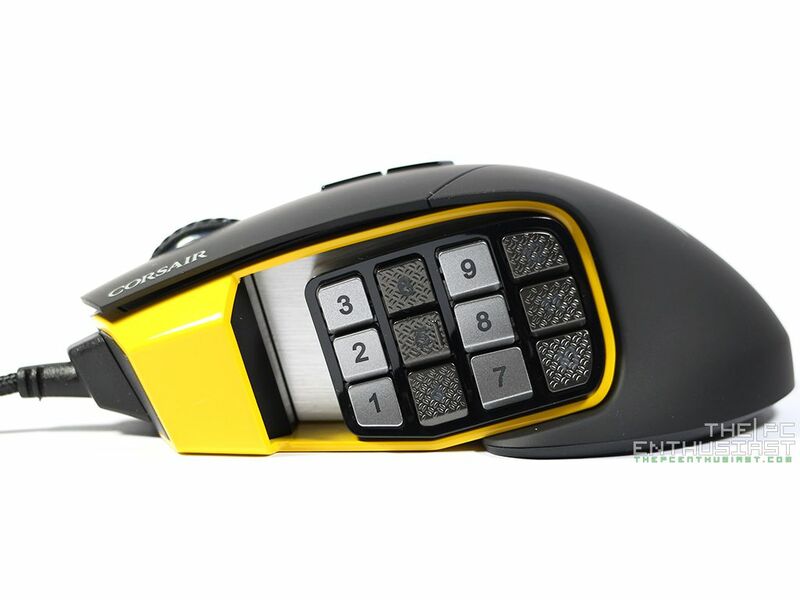 There are a total of 17 buttons on this mouse, of which 12 of them are on the key slider. Admittedly, it took me some time to adjust to the key slider. First time I used it, it felt a little bit awkward having several buttons on my thumb. It makes me feel want to push them all constantly! Those are mechanical switch, but the feeling is not similar to a mechanical keyboard. The keys, when pressed, feel like a semi-dome / semi- mechanical button. There’s also a little play on the individual buttons, the good thing is that each column has an alternate texture for your thumb to feel. Depending on your mileage, it may take some time to adjust and familiarize with your thumb the keys without looking at them. The Key Slider can be adjusted by unlocking the hex screw located at the bottom of the mouse. A hex screwdriver is provided in case you don’t have one. Simply unscrew it and the slider becomes loose. You can adjust the slider by 8mm from front to back, depending on the size of your hand or the length of your thumb. I don’t have any problems with its locking mechanism, since the hex screw securely and firmly holds the key slider in place. 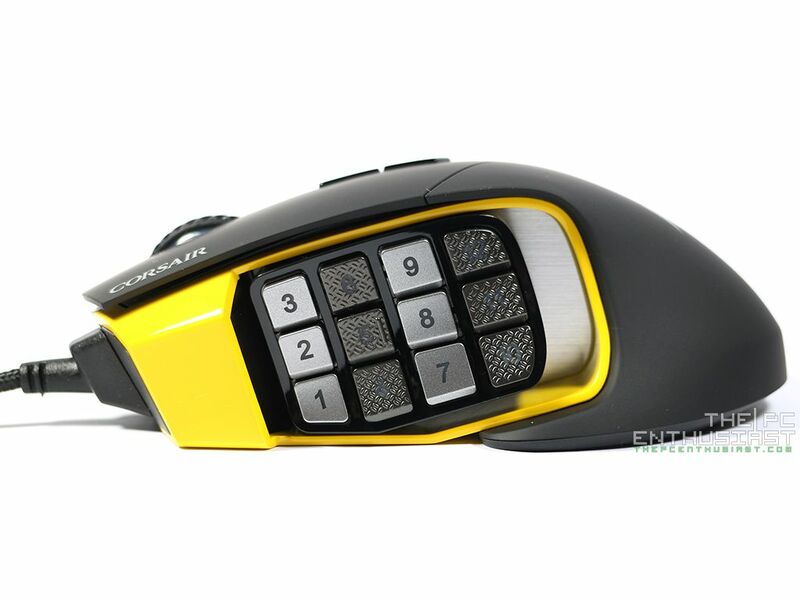 And I don’t think that you will need to constantly adjust the key slider since most of the time, there is only one person who is going to use this mouse, and that’s you. However, if you lost the hex screwdriver and you don’t have any other at home with the right size, you may need to purchase a hex screwdriver. 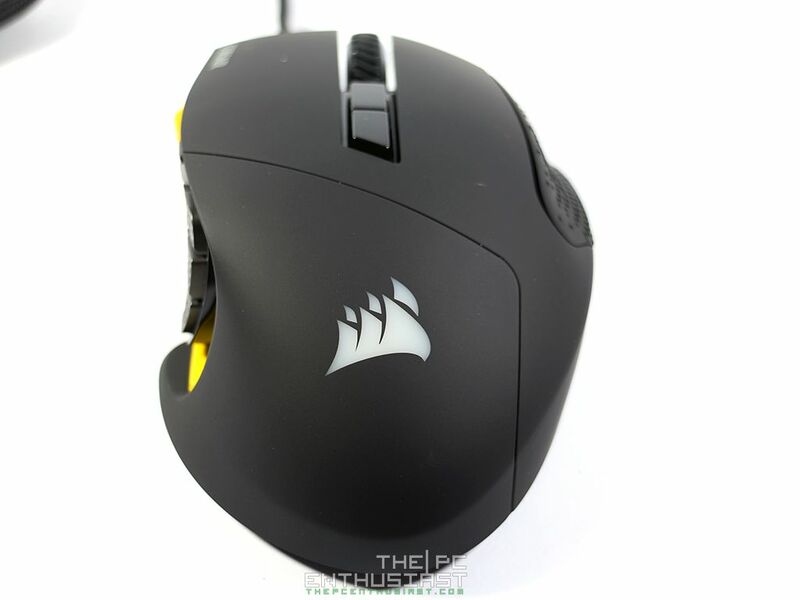 Hopefully, Corsair would use a tool-less mechanism (on their future mouse) if ever they plan to implement an adjustable feature, like the key slider. Corsair offers an all-in-one utility to control and customize their gaming peripherals – the Corsair Utility Engine or CUE. With the CUE, you can set and program the keys on the key slider; change the lighting effects; adjust DPI, calibrate surface and other options. From the Actions menu, you can set and program what each buttons on the key slider is for. There are presets, but you can also assign a function to a key. You can control the 4 zone lighting individually, or turn off one or two of the zones via the lighting menu. Next, you can manually adjust each DPI level, including a corresponding LED color for the numbers. You can also enable or disable angle snapping, enable or disable enhance pointer precision and adjust the pointer speed. 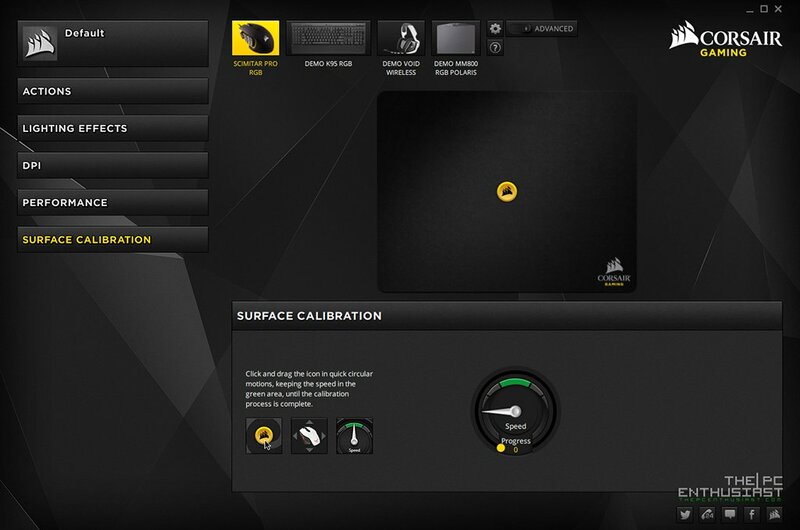 Finally the surface calibration is very handy since it will calibrate the Scimitar Pro RGB to adjust according to the type of surface that you have. 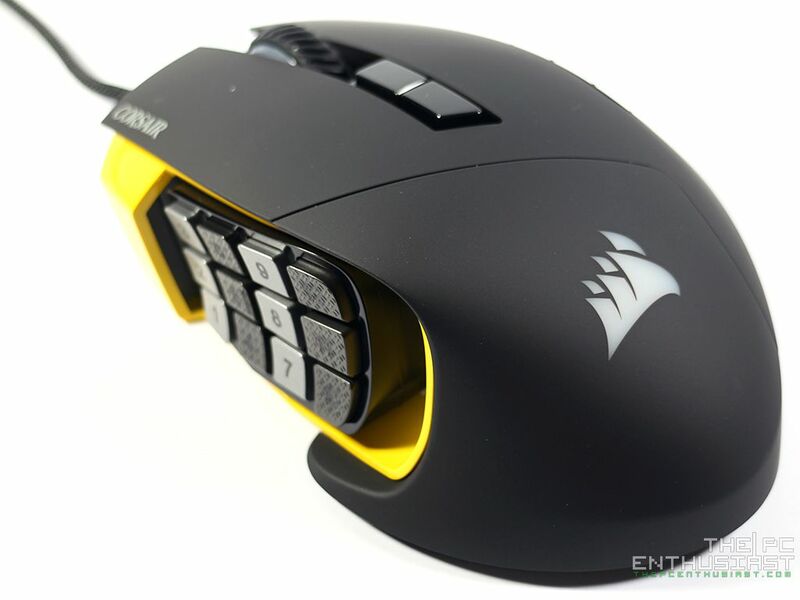 Like I mentioned before, I have been using the Corsair Scimitar PRO RGB for several weeks already. By now my hand has already somewhat adjusted to its smaller body and I can comfortably press the 7 to 12 keys without looking at them. Like I also said before, I don’t play MOBA or MMO games. Instead, I use these keys for desktop operation and other shortcuts for applications like Photoshop, Premier Pro and etc. Oh, I do use the shortcut keys when playing Dragon Age Inquisition. I have to be honest here; I don’t think many people will even use 16,000 DPI level. That is simply way too fast and very sensitive for me even on my 4K monitor. I am comfortable at 9,000 and below and most of the time I only use one certain DPI level. However, I do feel that the sensor is very good and precise. While I do not have an accurate tool to measure and give you exact scientific results; my years of experience with using different types of gaming mouse would tell me that the Scimitar Pro RGB has a really good control and level of accuracy. It doesn’t feel shaky or jittery as well and lift distance is (very) acceptable. Perhaps, if I were to nitpick, if the size was just a tad bigger than it is, it would perfectly fit my palm. I don’t have sweaty hands, so I’m not sure how the surface would react to users with sweaty palm. However, after several weeks of using and without cleaning the surface, I am beginning to see marks where my two fingers usually rest on the left and right click area. The Corsair Scimitar Pro RGB Gaming Mouse is now available in the US and UK. 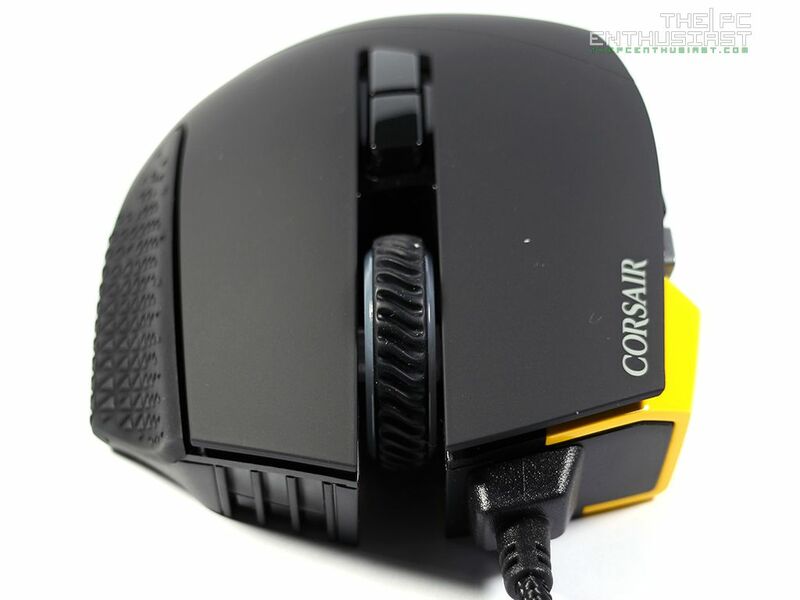 It comes with a manufacturer’s suggested retail price of $79.99 / € 7999 EUR and is backed by a two year manufacturer’s warranty and the CORSAIR worldwide customer support network. Prices do change from time to time and for latest pricing and availability, please check the links below. 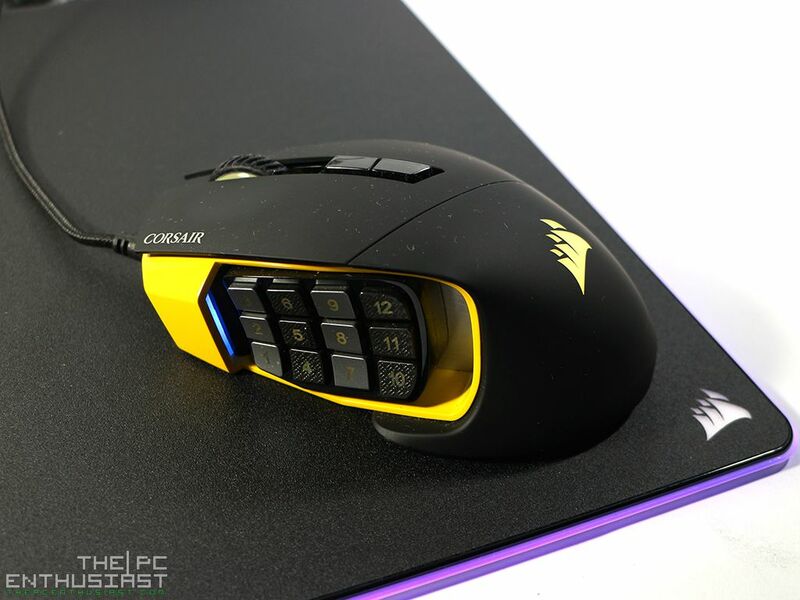 Corsair has made another really good product in the form of the Corsair Scimitar PRO RGB. The sensor is really good, including the set of features and its functions. I don’t see any problems with it at all; except probably for the fact that it is a bit smaller for my hand. But then again, that’s a subjective matter and it depends on your preference. The Scimitar PRO RGB is primarily designed for MOBA and MMO players but like I said, I also find the additional keys on the sides really useful for productivity purposes as well. In terms of performance, the sensor is very good and spot on; and the 4 zone RGB lighting that can individually be controlled looks really nice, specially at night. My overall experience while using this mouse is really good and I think I will be using this as my daily driver. I don’t have anything to say further, it’s simply a great product. 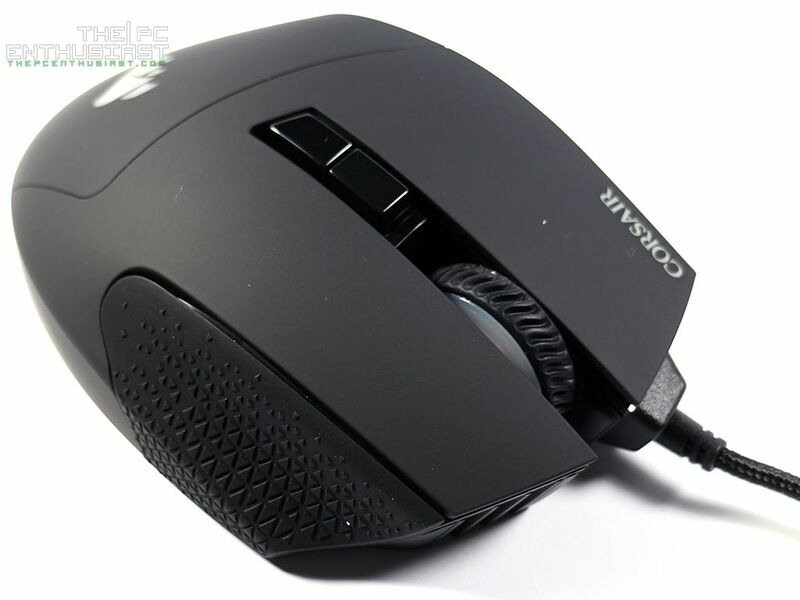 There are a few MMO-centric gaming mouse out there; like from Logitech, Razer, and other OEM brands. I think one of their advantages (or only advantage) over the Scimitar PRO is their price. Overall, the Corsair Scimitar PRO RGB is a well-built premium gaming mouse. Gaming peripherals are mostly decided by personal preference and their prices. 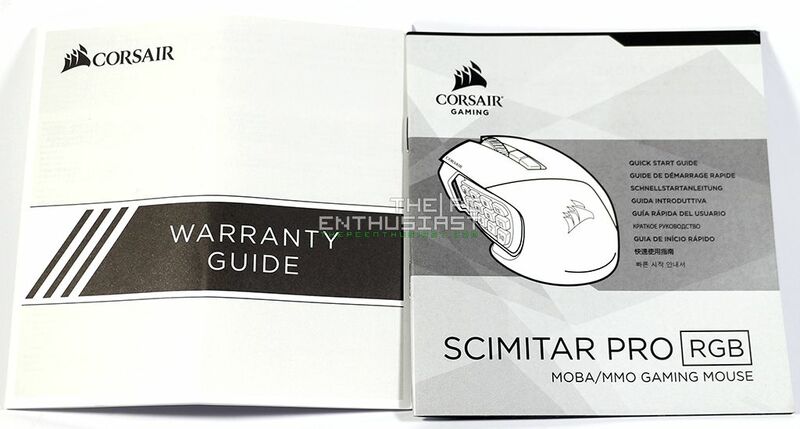 So if you are into MOBA or MMO games, or you need more buttons on your mouse; you like the design, fits your budget and it checks the things that you need on a mouse, then consider the Scimitar PRO RGB on your top list.